Note: we are rolling this feature out gradually. If you still see the old Kanban board and you would like the new one, please contact us! The Kanban board in FogBugz is useful for visualizing what cases are being worked on and where they are in your development process. Once you’re looking at the Kanban view, you can easily create Kanban columns and drag cases from one column to another. Kanban columns exist on a pre-planned basis, but they can be added, subtracted, or re-ordered separately for each milestone’s Kanban board. There’s also a handy “Planned Cases” column which holds all cases in this milestone which haven’t yet been put in a Kanban column. The Kanban board inherits projects from its parent planner. Since it drills down into a single milestone, it will only showcase from projects that exist in the planner to which that milestone belongs. For more information on how planners are configured, see the “Getting Started” section here. 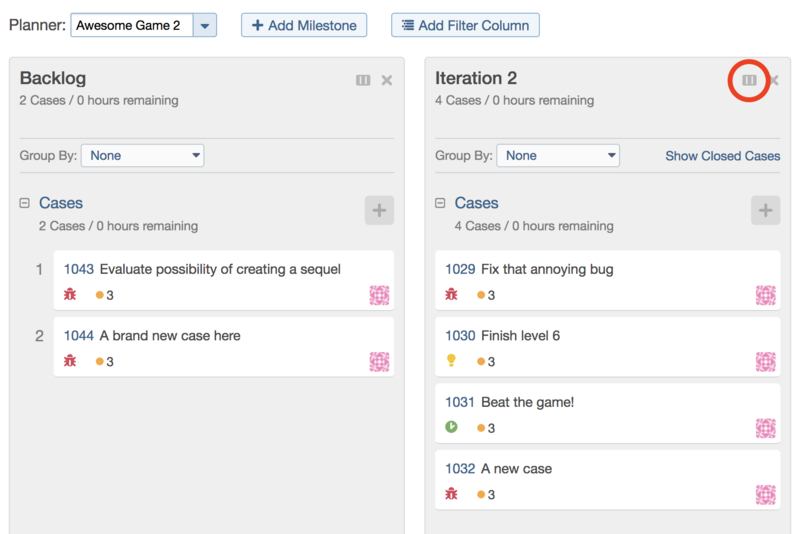 Clicking on the Add (+) button in a Kanban column provides a nice interface for adding cases to the Kanban board. You can either type the name of a brand new case to create it on-the-fly in that column or you can start typing the case number or name of an existing one in the milestone and the case will appear, allowing you to select it to be added. You can also click on “Cases in this milestone” to see a list of cases in the current milestone from which you can select cases to add. The cards visible on the Kanban Board can be filtered in the case list page using the Search Axes. In particular, cards can be filtered on the axis “Kanban”. For example, searching for Kanban: ”To-do” will create a filter of cases in the “To-do” Kanban column.